We are keeping things a little more low-key this year for Christmas, but when our church's children's director gave me this handprint Christmas tree idea, I knew we'd do it. Really it took just a few minutes. 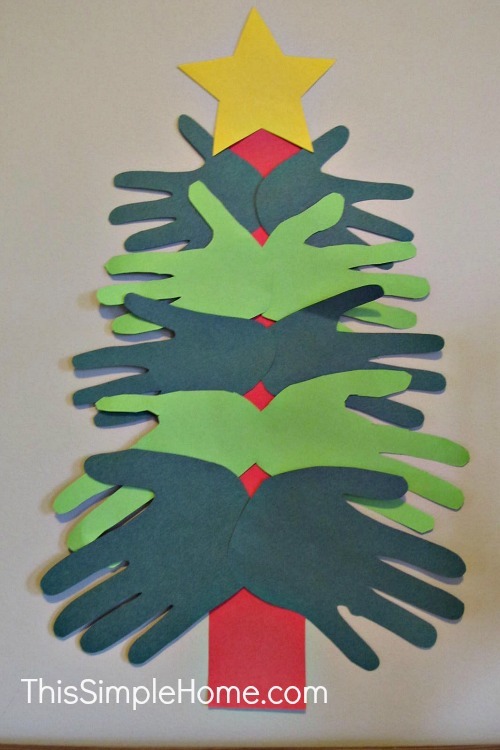 I traced all the hands and Big Sister helped me cut them out. We have it displayed above our sofa table. The handprint Christmas tree is a nice crafty touch to our home. If you don't already follow This Simple Home on Facebook, do so today! I've been giving daily recommendations for children's Christmas books as we read through our collection of Christmas books. (These are some of the HIGHLY recommended Christmas books! Lots of fun! This is a super fun looking craft. I love all things handprint! Thank so much for sharing at You're Gonna Love It. I'm going to share you project on Pinterest!